Vilnius has been on our watch list for a while to discover its coworking spaces. We’ve been reading all very positive news about how much a business-friendly country Lithuania is, making it an ideal home for young entrepreneurs and skilled professionals. This strong pool of talent has attracted big corporates and start-ups like IBM, Barclays, Western Union, Uber, Wix.com, and several more who are relying their growth on the Lithuania’s ambitious, energetic and skilled and young talent. All these factors combined, plus one of the fastest internet access in Europe, plus the growing startup ecosystem set the stage for Vilnius to be the perfect city to excel in the coworking scene, offering a variety of coworking spaces for every taste and desire. First of all, Vilnius is a very compact and smart city making commuting from A to B very smooth and easy. I wouldn’t be able to visit eight coworking spaces all in one day otherwise. My first stop was B Easy, conveniently located in the center. They are focusing more on private offices and meeting rooms, while still offering coworking areas. Make sure you enter from the main door on J. Basanavičiaus str. 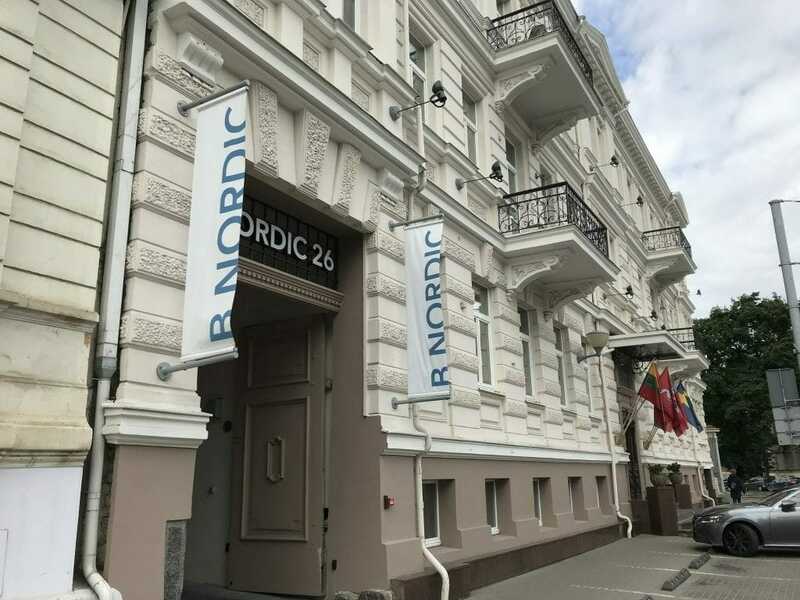 26, and stop by at their reception, instead of following the “BEasy biurai” sign at their car park entrance! Otherwise, you will likely get lost, like me, as doors and elevator are all card-operated 🙂 B Easy is elegantly designed, and is offering virtual office and assistance services as well, which is a great flexibility to help you focus on your core business. Coffice is a mini coworking space, operated by an advertising agency who is also using Coffice as their main office. It’s such a cosy and inspiring place, giving you the feeling of a “home office” with beautiful choice of retro furnitures, paintings on the wall, comfortable couch, and the friendly owners. Just be aware that while it’s just on a main street there is no obvious sign at the door, and they are on 3A, not on “3” which is another building that I first had to venture. 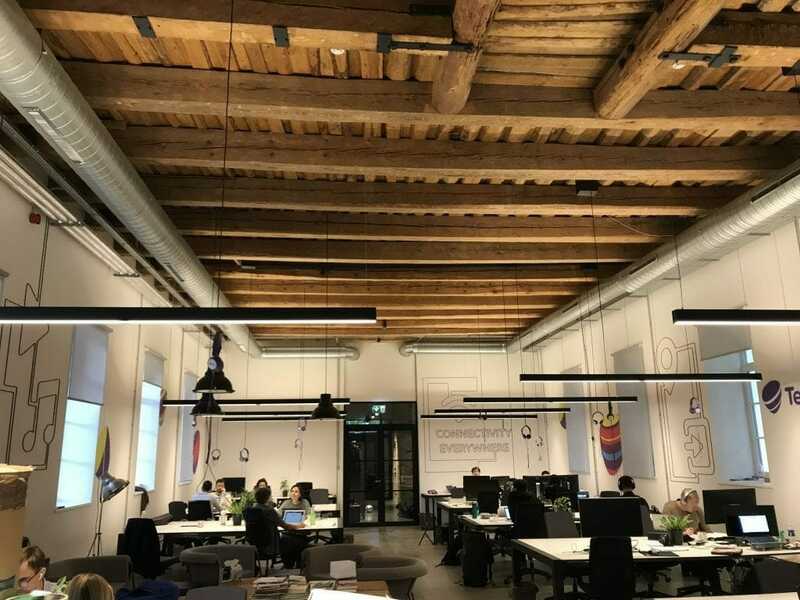 They are the first coworking space in Lithuania, operating since 2009, although their current location at Tauro g. 12 is their third location. They are an NGO serving social innovators and entrepreneurs, aiming to create more value for the society jointly. 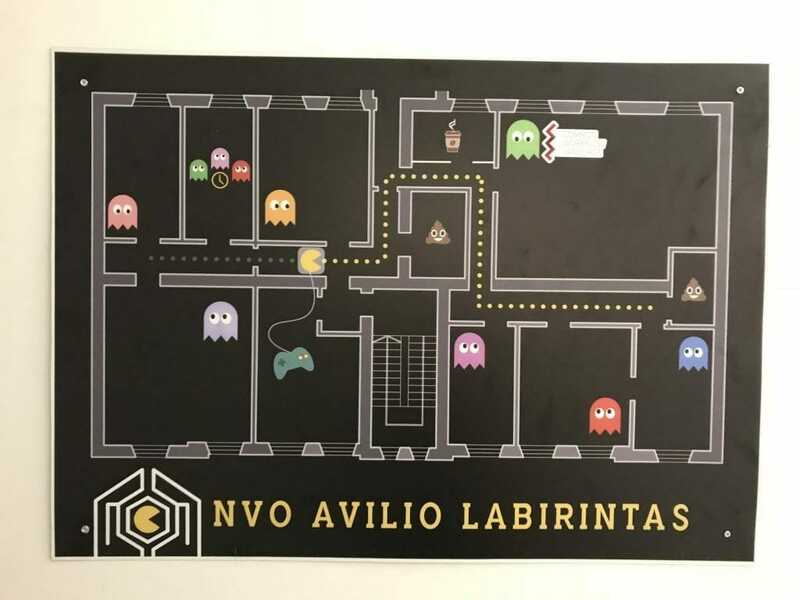 They are located in a very nice building, on the top floor, with an office space like a maze, which they have conveniently and creatively mapped on a Pacman poster to show what is where. They are offering only monthly memberships, however are welcoming the occasional daily users with their free day (trial) pass too. My next destination was Monday Office, on the other side of the river, which took just few minutes with Taxify, which became my new favorite for local rides here in Vilnius! Monday Office sets a new bar for coworking, and set it very high. It’s beautifully designed by award winning architects, and is offering full professional office services to keep you focused on your work. But not only that! They have thought of every fine detail, from the exclusive coffee brands to daily fresh snacks, from showers (which is actually an essential and not luxury, if you are biking to work!) to soft towels and fragrances! We’ve had a great long, and very inspiring chat with Jurgita on their vision and plans, and they are just rolling up their sleeves to step up the coworking scene. 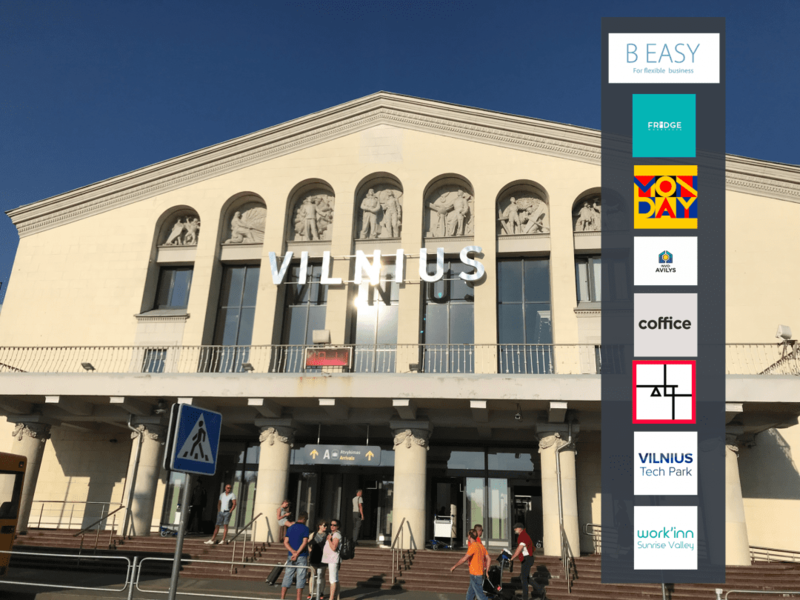 In Vilnius, coworking spaces are gathered mostly in the center and to the north-eastern part of the city, so it was time to move north-east, which again was a short 10-min ride. AltSpace has exclusively oriented towards creators and their supporters, and they are carefully curating whom they will accept into their coworking space. You may still have a chance to get your seat there even if you are not in the creative industry though they have quotas to maintain a good balance of diversity. 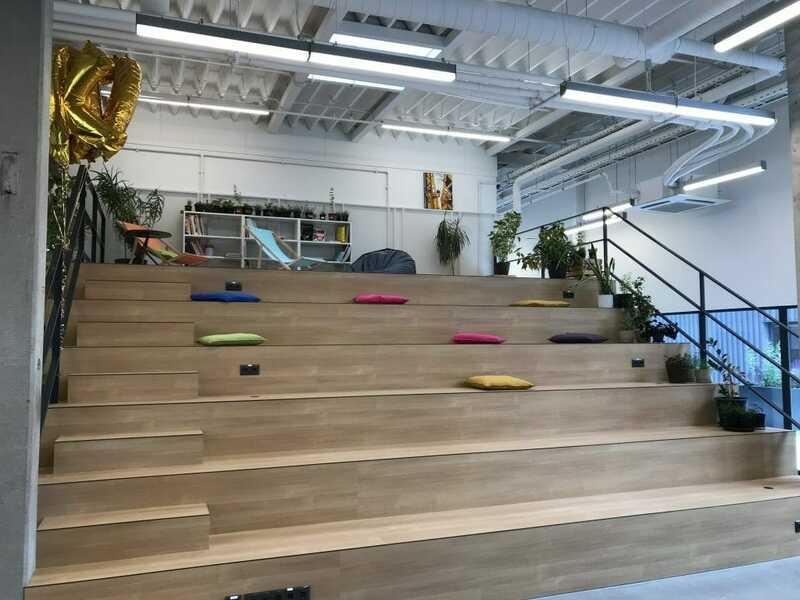 They may well be the biggest coworking space in Vilnius with their 1200 square meters of floor space. Altspace is offering a variety of coworking areas to serve every need, including a tv studio for live broadcasting and multifunctional hall. They soon plan to expand to the terrace to make it an open space for concerts and events! As you enter Altspace, you are simply astonished by the choice of colors, with plenty of natural light, high-ceilings in industrial style. It’s simply beautiful. But of course, coworking is not only about the desk and tables, so they have you covered well with their community breakfasts, member-driven events and various capability building opportunities. My next destination was Telia Hub, located in building 5 of Vilnius Tech Park. Telia Hub is the coworking space offering flexible and fixed desks in a well-renovated beautiful old building, whereas Vilnius Tech Park offers more options of private offices in their bigger campus deserving its reputation of being the ICT hub in the region. Telia Hub is an inspiring coworking space for solo-entrepreneurs or small start-up teams who would enjoy all the facilities and network of the Tech Park, being surrounded by like-minded coworkers. Next in my list was Work’inn, located in Sunrise Valley, the science and technology park (SSMTP), next to the Vilnius Technical University. They are a relatively small coworking space, offering flex and fixed desks and two meeting rooms. However, as they are part of a bigger business center, there is many private office options just upstairs in the same building. They are offering special prices (with more than 50% discount) for students. Andddd, coffee is free, as well as the attendance to events hosted by the SSMTP. My final stop was at Fridge, a small, closed-community coworking space located on Panerių g. 39 to the south-west of old town. I had to call Martynas, the owner, when I was at the address as the entrance is a bit tricky. When you are there, enter from the white door, take the “new” elevator at the end of the corridor, and go to the 7th floor. 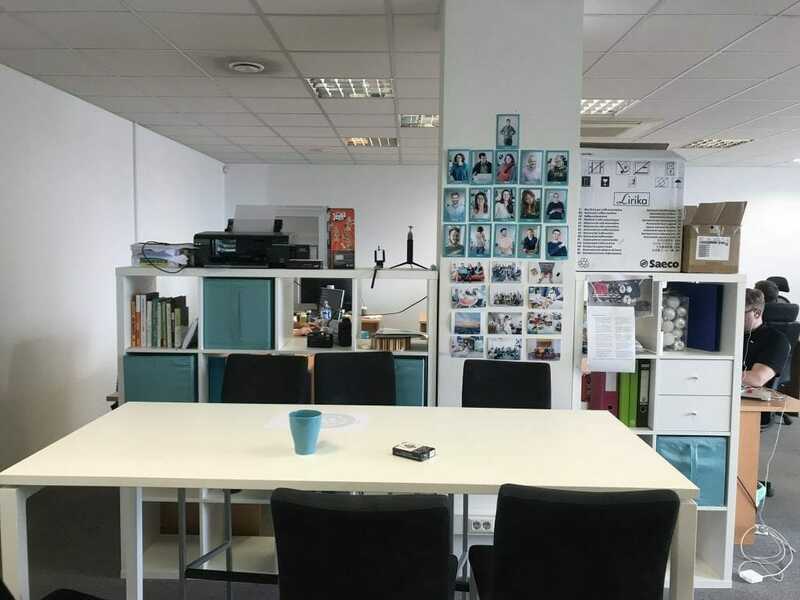 And the one-big-room coworking space of Fridge will greet you warmly. 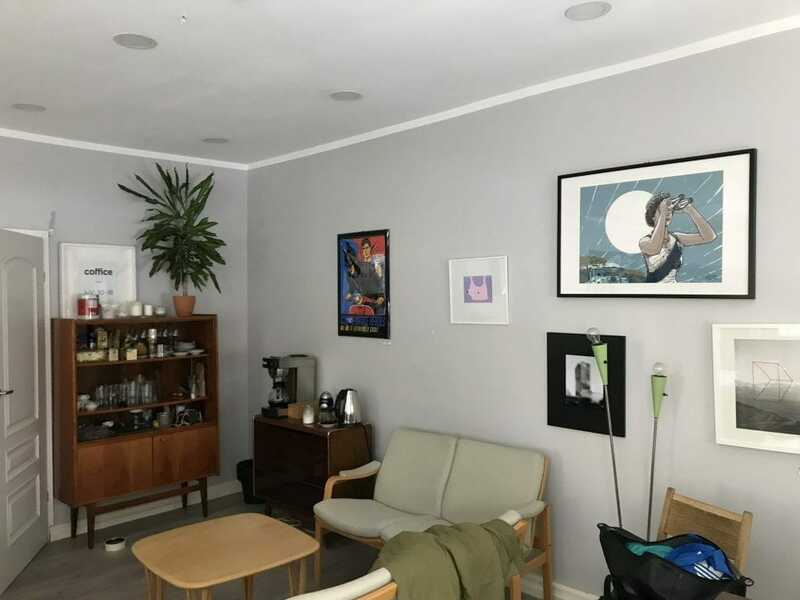 Martynas is a freelance photographer, and did not miss the opportunity when he found this space while he was looking for an office for himself though it was much bigger than what he needed and turned it into a coworking space. And expanded to a second room when it was available on the same floor. A very familiar story for many coworking spaces! There was one more coworking space in my list for Vilnius, the Workland, that I regretfully missed to visit this time. But again, this was just one other awesome coworking trip that continued to prove that “every coworking space is unique,” but not only that! Vilnius is a promising city for coworking as both the demand and supply is increasing. 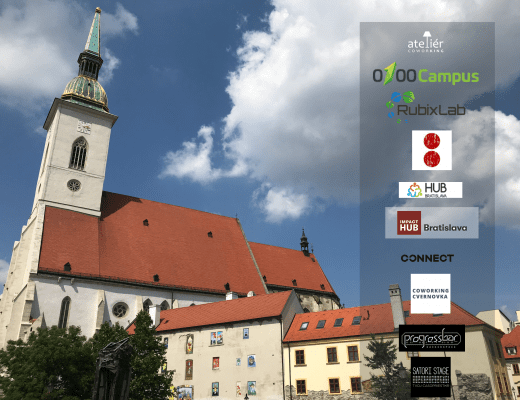 Several coworking spaces mentioned their plans to open new locations both in Vilnius and further in Lithuania and in the region. There is a great vibe in the city driven mostly by students and entrepreneurs. Compared to its peers, Vilnius is very affordable when it comes to eating out and the daily essentials. Nearly everyone speaks English, and many speak another foreign language too, which they are proud of for being the second most multilingual nation in the EU. The city is green, very green, with large parks. And they are offering a start-up visa for non-EU nationals! 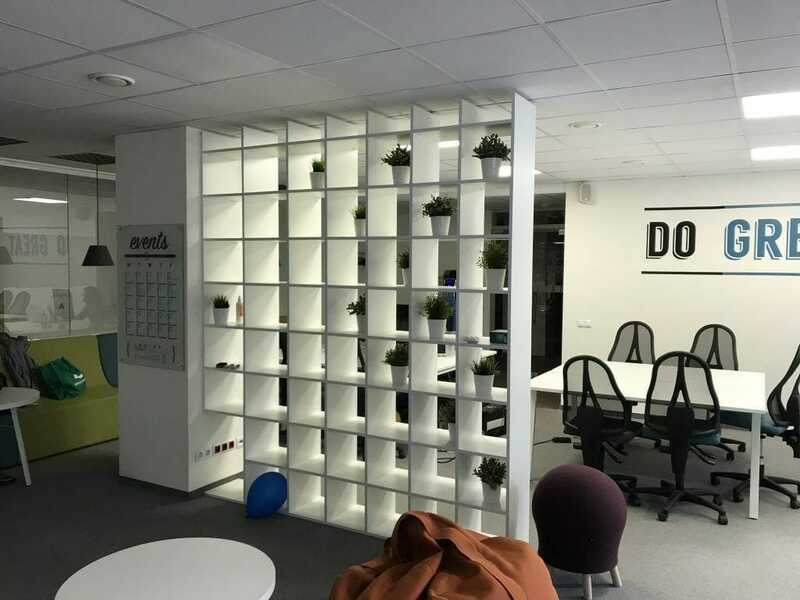 We will be happy and excited to add Vilnius coworking spaces to the Cowork7/24 platform where hopefully you’ll be able to book an awesome desk or meeting or meet a vibrant community whenever you need one!